The Riser is a patent pending collapsible shelving system that is added to your own suitcase. It features 3 shelves, a shelf divider, laundry compartment, and integrated shoe and toiletry pocket. All you have to do is hang the shelves, fill them up, and collapse them into your suitcase. Everything stays organized and wrinkle-free. Dimensions: 36" x 17" x 12"
•	Best travel accessory purchase in years! I gave this as a gift to a college student. She said that she will definietly use it, especially as she moves around. Impossible person to shop for and also a traveler? Time saving solution for short trips! Rise Gear luggage maximizes efficiency for people on the go. 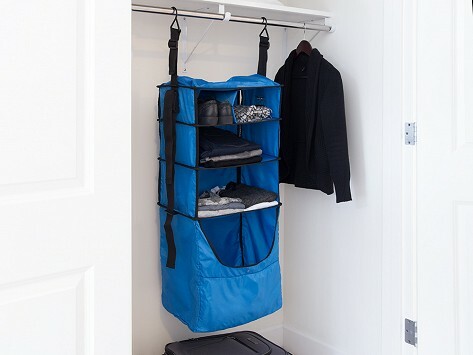 Collapsible shelves fit inside each bag, and quickly hang up at your destination. It’s like having a suitcase with a built-in closet. Specially-sized compartments keep items organized and neat. Underwear, shoes, clothes, and even dirty laundry stay separate. Zippered pockets hold things like toiletries, electronics, and charging cords, too. Co-Founder Lee Renshaw had the idea for Rise Gear in college, after constant couch surfing and living out of a duffle bag. He felt disorganized, and his wardrobe looked wrinkled. He envisioned a bag with shelves, taught himself to sew, and built the first prototype. Lee, together with his brother and Co-Founder Sean, threw themselves into the business and brought Rise Gear to life for travelers everywhere. Whether you’re on a day trip, weekend jaunt, or lengthy vacation, packing and unpacking is easier than ever before.